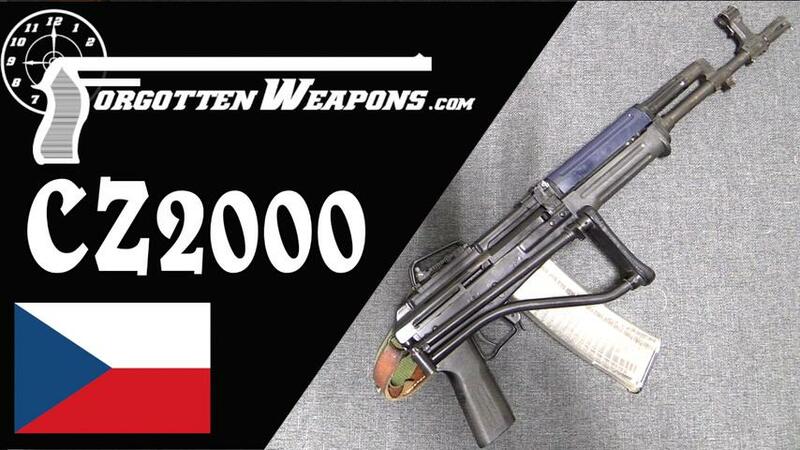 Development of the CZ-2000 began in the 1970s as a replacement for the vz.58 rifle. The project was named "Lada", and was essentially an improved AK-74 rifle chambered for the 5.45x39mm cartridge. The new rifle was mechanically an AK, but had a number improved features including a thumb-operated safety/selector switch, aperture sights mounted on an improved receiver cover, and a compact sidefolding stock. By the late 1980s rifles were going into limited initial production for troop trials, which were finalized in late 1989 - just as the Velvet Revolution overturned the government. When the aftermath of the political changes began to shake out, the new Czech Republic was looking to the West and NATO for affiliation, and the 5.45mm cartridge no longer made a lot of sense. Instead, CZ redesigned the rifle to chamber the 5.56mm NATO round, and renamed it the CZ-2000 to sound a bit more modern. Three variations were made; a short barreled "submachien gun" version, a rifle/carbine version, and a light machine gun version with a longer barrel and bipod. The rifle was not successful in military trials, and was eventually dropped by CZ in favor of the rifle that would become the CZ805 "Bren".